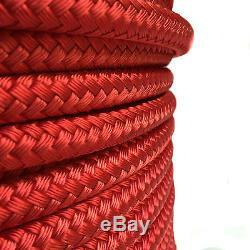 10 mm Red Double braid polyester x 100 metre reel. This rope offers the cruising or racing yachtsman a halyard range with outstanding performance. The rope is 100% polyester with a braided core covered with a durable braided cover giving the rope the name braid on braid. This construction gives the rope flexibility and durability which makes for good winching and block running. Braid on Braid ropes are pre-stretched for halyard performance and are designed to replace wire/textile rope halyards. 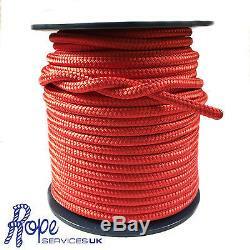 These ropes are easily spliceable using hollow fids for forming eyes or for joining ropes. Very low extension under load. Easy to splice with good retained strength. Braid on braid is also designed for racing yacht sheets, reefing lines, control lines. MAX LENGTH - 100 Metres. With the exception of the following codes. PA PH AB IV KW. Isle Of White, Scilly Isles, The Channel Islands, Northern And Southern Ireland. Europe and the rest of the world. The item "10mm Red Double Braid Polyester, Braid on Braid, Marine Rope, Cruising Line x 100m" is in sale since Tuesday, September 5, 2017. This item is in the category "Sporting Goods\Sailing\Marine Rope". The seller is "ropeservices" and is located in Houghton Le Spring. This item can be shipped to United Kingdom, Antigua and barbuda, Austria, Belgium, Bulgaria, Croatia, Cyprus, Czech republic, Denmark, Estonia, Finland, France, Germany, Greece, Hungary, Ireland, Italy, Latvia, Lithuania, Luxembourg, Malta, Netherlands, Poland, Portugal, Romania, Slovakia, Slovenia, Spain, Sweden, Australia, United States, Canada, Brazil, Japan, New Zealand, China, Israel, Hong Kong, Norway, Malaysia, Singapore, South Korea, Switzerland, Taiwan, Thailand, Bangladesh, Belize, Bermuda, Bolivia, Barbados, Brunei darussalam, Cayman islands, Dominica, Ecuador, Egypt, Guernsey, Gibraltar, Guadeloupe, Grenada, French guiana, Iceland, Jersey, Jordan, Cambodia, Saint kitts and nevis, Saint lucia, Liechtenstein, Sri lanka, Macao, Monaco, Maldives, Montserrat, Martinique, Nicaragua, Oman, Pakistan, Peru, Paraguay, Reunion, Turks and caicos islands, Aruba, Saudi arabia, South africa, United arab emirates, Ukraine, Chile.